The State Government and Employees State Insurance Corporation (ESIC) Medical College and Hospital, Ner Chowk, Mandi signed a Memorandum of Understanding (MoU) to operationalise the Medical College from 2014-15 session. The MoU was signed by Ali Raza Rizvi, Principal Secretary, Health on behalf of State Government and D.S. Dhiman, Dean, ESIC Medical College in the presence of Chief Minister Virbhadra Singh here today. Speaking on the occasion, Chief Minister said that in the initial years Mandi Zonal Hospital would be attached to the ESIC College for training of the students. He said that State Government had made sincere efforts to operationalise Medical College from the next academic session. The College would have initial capacity for 100 MBBS seats every year out of these 40 seats would be filled up through all India merit, 40 seats would be filled through State merit and 20 seats would be reserved for wards of ESIC employees and insured persons. He said that Rs. 750 crore would be spent on this Medical College and Hospital. He said that it was a big step in medical education and health sector. 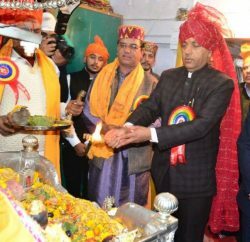 Virbhadra Singh said that State Government was committed to provide better health services to the people of the State and annual plan allocation for health sector had been increased to 24 percent and annual plan under National Rural Health Mission to Rs. 220 crore from Rs. 158 crore during this financial year. He said that plan allocation for medical education had been increased to Rs.30 crore from Rs. seven crore which was more than four fold increase. 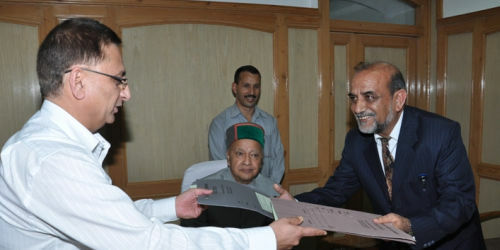 Chief Minister said that Indira Gandhi Medical College, Shimla had been included under PMSSY and Dr. Rajendra Prasad Medical College, Tanda was being upgraded to provide Super Speciality Services in Radiotherapy and Oncology, Gastroenterology, Cardiology, Cardio-Thoracic Surgery and Neurosurgery. 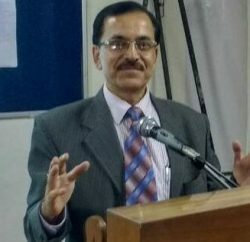 Amitabh Avasthi, Special Secretary, Health, B.S. Negi, Regional Director, ESIC, Baddi and other senior officers were also present on the occasion.